A 69-year-old female patient was admitted to the hospital with malaise and abdominal pain. On hospital day five, the patient developed signs of sepsis and new-onset atrial fibrillation along with a quickly progressing cardiac conduction abnormality. Repeat imaging revealed acute cholecystitis, and emergency surgery was scheduled. In the holding area, the anesthesiologist performed a cardiac physical exam, which revealed a previously undocumented diastolic murmur. 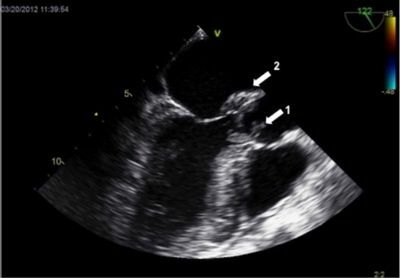 This new finding prompted the use of an intraoperative transesophageal echocardiogram (TEE), which subsequently revealed an aortic root abscess with an aortic valve vegetation (figure 1) and severe aortic insufficiency. Twelve days later, the patient underwent an aortic valve replacement. This case underscores the importance of physical exam of the anesthesiologist as it may reveal imperative information that may have been previously missed by other clinicians and highlights the importance of the utilization of the intraoperative TEE as part of the anesthesiologist’s skill set.